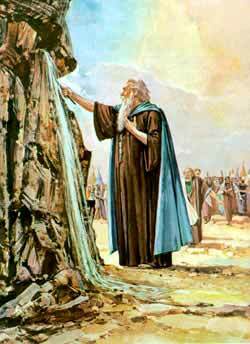 Moses strikes the rock with his rod, and water comes forth. FTER THE EGYPTIANS had been all destroyed, the Israelites went forward into the wilderness; and when they had been traveling three days, they were in distress for want of water. They did indeed find some at a place called Marah, but it was so bitter they could not drink it. So again they reproached Moses, as they had done when the Egyptians pursued them to the Red Sea, asking him what they were to do for drink. Then God bade him throw into the water a certain tree which He showed to him; and when Moses had done this, it became quite good to drink. In a few days after, the people were in want of food; and again they were angry with Moses and his brother Aaron, who was with him taking care of the Israelites. They said they wished they had stayed in Egypt, where they had enough to eat, for they had been brought into the wilderness only that they might die of hunger. Then Moses asked them why they murmured against him and Aaron, when it was God Himself who had brought them out of Egypt; their murmuring was really against God. And yet, though He was displeased at their conduct, He would supply them with food, that they might know that he was indeed their God. So, in the evening, great flocks of quail came about the camp for the Israelites to eat; and in the morning, when the dew was dried up from the ground, there lay upon it a small round thing, like coriander seeds. The people did not know what it was; but Moses told them that was bread that God had sent them. There it was, fresh every morning, except on the seventh day, which God had in the beginning made a day of rest. On that day He would not have them gather it, giving them twice as much on the sixth day, that they might have enough for the seventh. This was called "manna"; and when it was ground, like grain, they made bread of it. God gave it them for forty years, till they came to the land of Canaan. But, though God had done so much for them, the children of Israel were a most ungrateful people. The very next time they wanted water, they were so angry with Moses that they were ready to kill him. Then Moses prayed to God to tell him what to do. And God bade him take some of the chiefs of the people, and go to a certain rock in Horeb, and strike it with his rod, and water should come out of it. So he took the men with him, and struck the rock, and water flowed abundantly.